A new study from marine scientists at the University of Georgia reveals two important compounds not previously considered that are released into the ocean's dissolved organic matter pool by phytoplankton and subsequently removed by bacteria. The study, published in the Proceedings of the National Academy of Sciences in December, describes the cryptic currency of carbon cycling with new details on microbial food web processes. Though atmospheric carbon receives the lion's share of attention from climate scientists, an equal if not greater amount of carbon exists in surface ocean water. Pooled as organic matter that both removes carbon dioxide from the atmosphere when it is formed and transfers it back when it's degraded, the mechanisms behind what happens to this carbon in the surface ocean have been poorly understood. "Our paper shows that we may not be looking at the right compounds, or at least all of the right ones, when we work to understand how organic material is processed in the marine carbon cycle," said study co-author Mary Ann Moran, a Distinguished Research Professor in the UGA Franklin College of Arts and Sciences department of marine sciences. "We found two compounds that had not been considered before, yet may be among the most important compounds being transferred from phytoplankton to dissolved organic matter, then recycled by bacteria." The amount of carbon in the oceans is sufficiently large that even the smallest changes in ocean temperature or acidification could precipitate corresponding changes in cycling rates and atmospheric CO2 concentrations. For a process that has worked well for hundreds of millions of years, a changing global carbon budget has led to increased concern about the details of these processes. "The pool is large enough that small tweaks change the relationship between what's stored in the atmosphere and what's retained in the ocean," said study lead author Bryndan Durham, a 2014 doctoral graduate in the UGA department of microbiology. "We don't know how sensitive those different processes are so we don't know how vulnerable they are to change." The two compounds, dihydroxypropanesulfonate and N-acetyltaurine, were discovered by investigating gene expression changes in a model microbial system developed to observe phytoplankton-bacterial exchanges in seawater. Both compounds include a sulfur molecule, an indication that the discovery also will lead to a better understanding of sulfur cycling. Up to now, the chemical complexity of dissolved organic matter in seawater had impeded efforts to identify the key compounds released by phytoplankton into the ocean, then taken up and metabolized by bacteria. But the ability to identify transcriptional patterns in the model system allowed researchers an unprecedented view of the underlying process, including the discovery of these two compounds and potentially more. "Thanks to method advances in the field of chemistry, we can better measure compounds present in very low concentrations in seawater," Moran said. 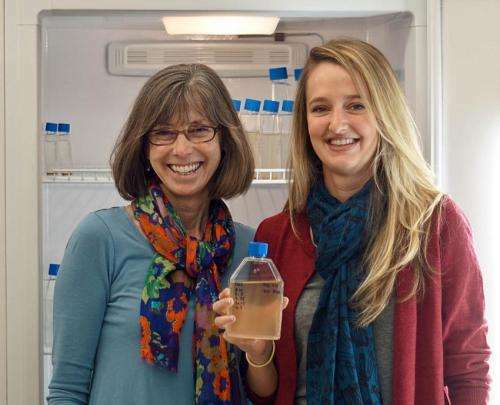 "And the ability to look at genes being expressed by microbes in the ocean is also very recent. Now we can put those two approaches together to ask questions we couldn't ask before." "As a field, the oceanographic community is now looking at compounds in seawater more broadly, using these new tools to ask the organisms what processes are important. As we do that, we'll continue to find missing pieces of the carbon puzzle."